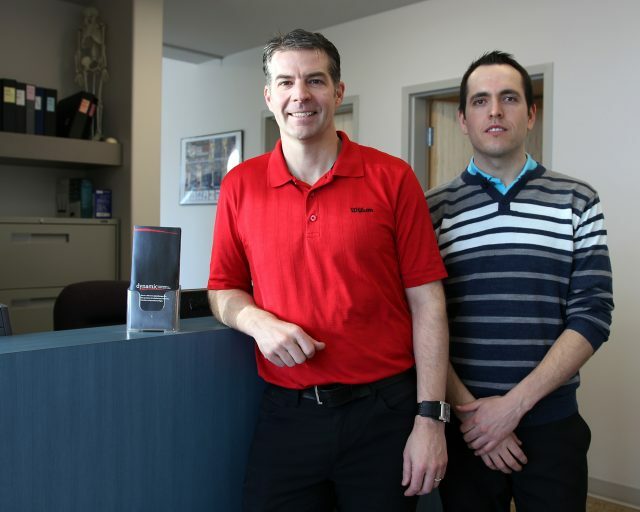 Darryl Ross and Joe Robertson from Dynamic Physiotherapy, in their new, second location at BU's Healthy Living Centre. Metered parking is available just outside the doors of the HLC south entrance. Reimbursement for parking will be available upon request. All appointments for our HLC clinic will be booked through the Dynamic Physiotherapy Richmond clinic (204-725-2098) or in person at the HLC clinic during the above hours. There will be not a receptionist on site outside the posted hours. Brandon University’s Healthy Living Centre is the new home to a Dynamic Physiotherapy clinic, which will deliver physiotherapy services five days a week in its convenient second location. The clinic is an expansion for Dynamic, which maintains its original location on Richmond avenue. The additional location is a great fit for Brandon University and for the Healthy Living Centre. “Many people know the Healthy Living Centre for our Bobcats events, our fitness centre, and our all-weather walking track,” said Russ Paddock, BU’s Director of Athletics and Community Engagement. “Fitness and healthy living are also about enjoying a full range of functional motion and restoring any impairment, which makes Dynamic Physiotherapy a perfect partner for Brandon University. The new clinic offers a full range of physiotherapy services, helping with a range of conditions, including sprains, strains, degenerative conditions, whiplash disorders, tendinitis, neck and back pain, post-surgical rehab, post-fracture rehabilitation, custom exercise programs, and vestibular disorders (dizziness/balance problems). Students may need a doctor’s referral; however some physiotherapy can be covered through the student health plan. Dynamic’s new clinic is also open to all members of the public, and boasts convenient parking and easy access just off of Victoria Avenue, not far from 18th Street. The best access is the south side of the Healthy Living Centre, with a direct entrance to the clinic and ample parking in the university’s Lot No. 10. Drivers can access the lot from Victoria Avenue, just behind the Glen P. Sutherland Gallery of Art. Ross says that the location is great for convenience, but also because of what the Healthy Living Centre represents.